The apprenticeships budget for England is set to be overspent by £0.5 billion this year, rising to £1.5 billion during 2021/22, according to the government agency for apprenticeships. The warning from the Institutes for Apprenticeships follows a refusal from the Department for Education last month to answer FE Week’s questions concerning the full levy costs. 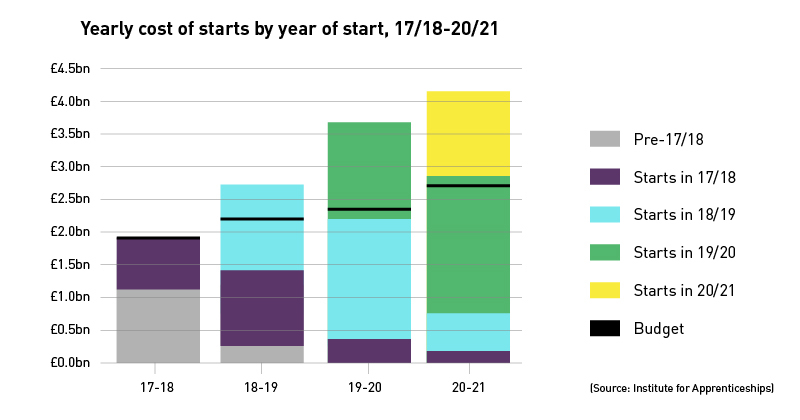 The problem – which comes despite the volume of starts dipping – is understood to be the result of higher per-start funding than first predicted, largely driven by the sharp rise in management apprenticeships with high prices. As more and more people start on these expensive apprenticeships, the monthly on-programme costs quickly accumulate – see below for FE Week’s analysis. Mark Dawe, the chief executive of the Association of Employment and Learning Providers, has demanded an “open debate on how the levy operates” following this revelation. 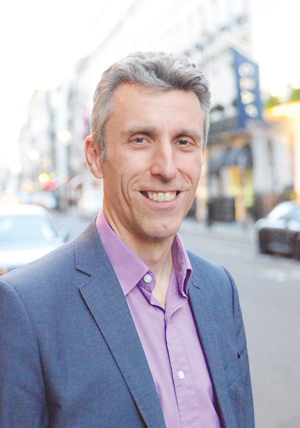 “At last it slips out into the open what we have been anticipating for months and what we predicted from the start: that more higher level expensive apprenticeships are consuming the bulk of the levy,” he told FE Week. Mr Dawe reiterated AELP’s call for a “separate £1 billion a year budget for non-levy employers” and “access to the £10 billion annual funding to HE”. Mr Dawe’s Association of Colleges counterpart, David Hughes, praised the IfA for being “open and transparent” in sharing the projected spend against current budget. He urged both the IfA and the DfE “to come forward quickly with the range of proposals that will be needed in order to remain within budget”. Robert Nitsch, the IfA’s chief operating officer, presented the IfA figures during an event for employers held at Exeter College on Friday. 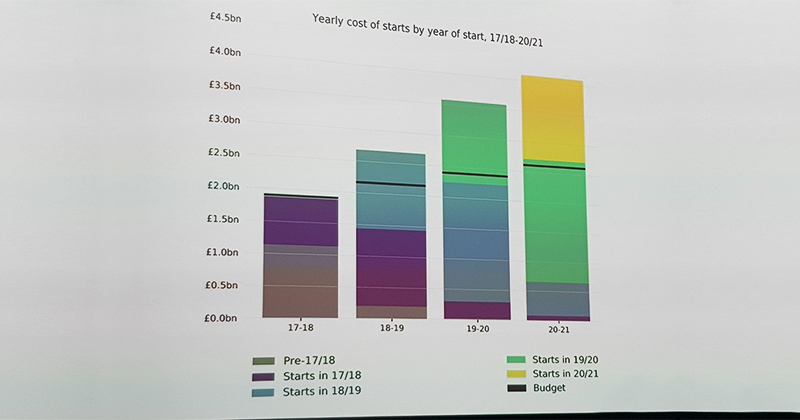 According to IfA slide (above), the yearly cost of starts this year will be £500 million higher than the £2.2 billion budget in 2018/19. The IfA told FE Week that the slide highlighted that there’s currently no unspent levy, and that – if apprenticeship numbers continue to rise – there could be a situation in the future where levy contributions may be insufficient to cover the full cost of apprenticeships. It also said that both Sir Gerry Berragan, the IfA’s chief executive, and skills minister Anne Milton had referred to this over-spend before – although it’s not clear when. FE Week has been unable to find any references to it, and has asked the IfA for examples. This is the first warning sign that levy funds are set to be over-spent, rather than under-spent. It’s particularly significant as the system was designed on the basis that levy-paying employers wouldn’t use all their funds, and that any surplus would be used to fund apprenticeships with non-levy paying employers. FE Week reported in November that employers had used just under 14 per cent of their levy funds to date, with £370 million out of a total £2.7 billion drawn down. But this draw-down by employers is just one of a number of costs that levy funds need to cover. Other expenses include funding apprenticeships for small, non-levy paying employers, English and maths qualifications, incentive payments for 16- to 18-year-old apprentices, and extra support for apprentices who are care leavers or have special needs. FE Week asked the DfE last month how much of the levy pot has so far been used on these different areas, but it refused to say. Starts have been consistently down since the levy was introduced, with the most recently published figures showing a 43 per cent drop in July compared with pre-levy numbers. But at the same time the number of starts on costly management apprenticeships has sky-rocketed. FE Week was first to warn of the ‘unstoppable rise’ of management apprenticeships in 2016, and last month reported that just 10 management standards were responsible for a fifth of all apprenticeship starts on standards, according to provisional data for 2017/18. The proportion has grown over the years, from nine per cent in 2015/16 and 15 per cent in 2016/17. The IfA is in the process of carrying out funding band reviews of a number of early-approved standards – many of which have resulted in the band being slashed. According to the IfA’s 2018/19 business plan, the review is to ensure “they support high quality delivery, and maximise value for money for employers and the taxpayer”. The outcome for three management standards, including the chartered manager degree apprenticeships, is still unknown as the employer group behind them appealed against the recommendation. Meanwhile, the IfA is set to announce the second batch of standards for which they will begin consulting on funding rate changes on Tuesday. FE Week analysis of figures published by the DfE for the management degree apprenticeship shows the number of starts rose from 576 (up to £15.5 million) in the year to July 2017 to 2,259 (up to £61 million) in the year to July 2018. Initially, the Education and Skills Funding Agency would only be paying a fraction of this £76 million because the monthly payments are spread over the full duration – typically 48 months for the level six standard. 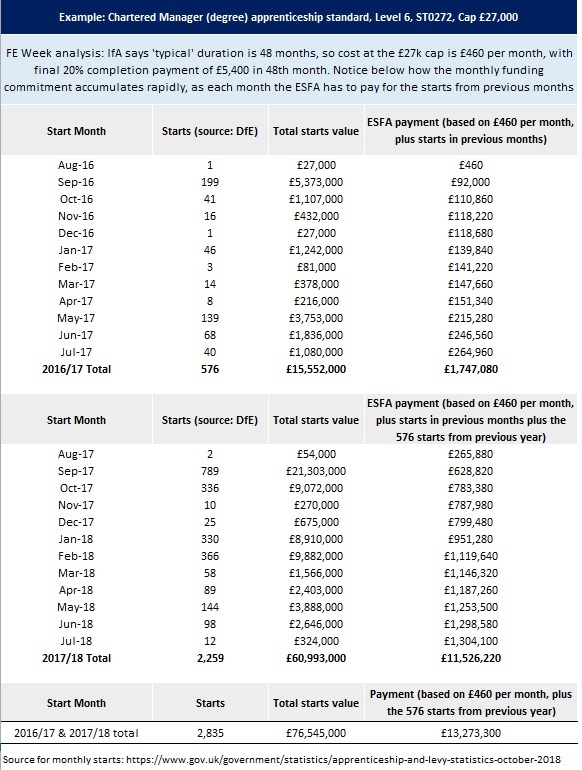 But the costs quickly accumulate as each month the ESFA is paying the on-programme costs of the starts in previous months, until the course finishes and the final 20 percent is paid for completion – see analysis below. I do hope that these calculations in terms of Levy spend are not not based on FIS reports. In our case, FIS reports indicate £1 million over our actual and indicative earnings for 18/19. This is a well documented issue on FE Connect where ESFA software is not calculating funding claims correctly for apprenticeships.